Alumni in Class of 1923 H.S. Have radiator parties and scribble on the walls. We have to squeeze to do it, but otherwise we're fine! And seems to interfere to make our best of plans a wreck. As proper eds and co-eds as one could wish to see! Note: At "50 to a class" the 1923 roster in the BYU Banyan was short by about half. However, with additional research by Scott Cowley in the BYU Records Office, we have been able to round out the class with 57 profiles. BYH Class of 1923. Clement "Clem" Allred (male, twin). There are two Allreds shown in the 1924 composite picture in 1924, and they were twin brothers. Source: 1924 BYU Banyan yearbook, BYH section. ~ ~ ~ ~ Clement Allred (male, twin), of Vernon, Utah. Clement and his brother, Clemont, were born on June 7, 1903 in Ferron, Utah, and came to BYH from Vernon, Utah. Clement married Mary E. Macdonald, age 20. Her parents were John Hall Macdonald and Ellen Grey Macdonald. Clement died on July 9, 1978 in Lawndale, California. ~ ~ ~ ~ Clement completed his senior year at BYH in the Class of 1923. Background sources: BYU/BYH Annual Catalogues for the School Years 1923-24, 1924-25, and 1925-26. ~ ~ ~ ~ HIS OBITUARY: Clement Allred died suddenly on July 9, 1978. He was 75 years old. He was born June 7, 1903 in Ferron, Emery County, Utah. He was the son of Ephraim Lafayette Allred and Harriet Matilda Brunson. He graduated from Brigham Young High School in Provo, Utah, in the Class of 1923. 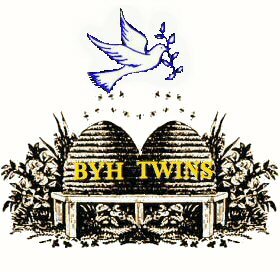 He moved to California with his twin brother, Clemont [BYH Class of 1924], in 1929 and lived the balance of his life there. He retired from Alcoa (Aluminum Company of America) in 1963. He remained very active in the Church of Jesus Christ of Latter-Day Saints and along with his wife, Mary Allred, served a two-year mission for the church from 1970 to 1972. He is survived by his beloved wife Mary E. [Macdonald] Allred, two daughters, Barbara Allred Aylesworth of Rolling Hills, California, Pat Allred Burnell of Lawndale, California, and his son, Donald Clemont Allred of Sherman Oaks, California. He also leaves l2 grandchildren. Services were held at the LDS Hawthorne Ward Chapel, Wednesday, July 12, 1978. Interment: Inglewood Park Cemetery. His grave was dedicated by Bishop Robert L. Jex. Clement Allred is loved by all who knew him and he will be sorely missed. Source. 1923 News Article. Class of 1923. Merrill Allred. He received a High School Diploma in 1923. Source: Annual Record, B.Y. University, Book 10, page 486. Class of 1923. Ruby Baird. She received a BYH Normal Diploma in 1923. Source: Annual Record, B.Y. University, Book 10, page 136. Classes of 1921 and 1923. Class of 1921. Dorothy Beesley. She received a BYH Normal Certificate in 1921. Source: Annual Record, B.Y. University, Book 10, page 204. ~ ~ ~ ~ Class of 1923. Dorothy Beesley. She received a BYH Normal Diploma in 1923. Source: Annual Record, B.Y. University, Book 10, page 204. ~ ~ ~ ~ Collegiate Grad of BYU, Class of 1926. Dorothy Beesley. She received a BS Degree in Physical Education in 1926. Source: Annual Record, B.Y. University, Book 10, page 204. Class of 1923. Rhea Blumenthal (female). Source 1: 1923 BYU Banyan yearbook, BYH section. ~ ~ ~ ~ Class of 1923. Rhea Blumenthal. She received a BYH Normal Diploma in 1923. Source 2: Annual Record, B.Y. University, Book 10, page 472. ~ ~ ~ ~ Rhea Dodd Blumenthal was born October 5, 1905 in Provo, Utah. Her parents were Henry Gustav Blumenthal and Myrta May Dodd Blumenthal. Rhea married Samson G. Sargis on May 28, 1936 in Provo, Utah. Samson Sargis was born on October 7, 1897 and died in April of 1987 in Pacifica, San Mateo County, California. Rhea Blumenthal Sargis died on April 24, 1949 in Salt Lake City, Utah of leukemia. Her interment, Salt Lake City, Utah. Classes of 1921 and 1923. Class of 1921. Melva B. Boyle. Source: 1921 BYU Banyan yearbook, BYH section. ~ ~ ~ ~ Class of 1923. Melva Boyle. She received a BYH Normal Diploma in 1923. Source: Annual Record, B.Y. University, Book 10, page 206. ~ ~ ~ ~ Collegiate Grad of BYU, Class of 1925. Melva Boyle. She received a BS Degree in Secondary Education in 1925. Source: Annual Record, B.Y. University, Book 10, page 206. ~ ~ ~ ~ She is a daughter of BYH Principal William Henry Boyle, Jr. She was born August 17, 1903 in Provo, Utah. She married Laurence S. Hutchings, residing in Salt Lake City. She died on January 21, 1986. Class of 1923. LaVonne Bromley. She received a BYH Normal Diploma in 1923. Source: Annual Record, B.Y. University, Book 10, page 364. Class of 1923. Lila Burr. Source: 1923 BYU Banyan yearbook, BYH section. ~ ~ ~ ~ Lila C. Burr was born on November 30, 1900 in Koosharem, Sevier County, Utah. Her parents were William Clark Burr and Emma Constance Olsen. She married Melvin John Rudd on June 7, 1922 in Salt Lake City, Utah. She died on February 1, 1980 in Hermiston, Umatilla County, Oregon. Interment, Parker, Fremont County, Idaho. Class of 1923. Roma Byland. Source: 1923 BYU Banyan yearbook, BYH section. ~ ~ ~ ~ Mary Romania OR Roma Bylund was born November 6, 1904 in Provo, Utah. Her parents were Eric Olaf Byland and Elizabeth Louvinna Boyle. She married William Brownlee Hayes in December 1925 in Salt Lake City, Utah. She died September 9, 1972 in San Gabriel, California. Class of 1923. Harold Candland. Source: 1923 BYU Banyan yearbook, BYH section. ~ ~ ~ ~ His parents: Arthur Charles Candland and Lydia Hasler, married October 13, 1897, in Manti, Utah. They had nine children, including the following seven: Helen Candland, born September 18, 1901 in Mt. Pleasant, Utah [BYH Class of 1920]; Harold Arthur Candland, born March 16, 1903 in Mt. Pleasant, Utah [BYH Class of 1923]; Don Charles Candland, born February 4, 1909 in Mt. Pleasant, Utah [BYH Class of 1928]; Louise Candland, born December 12, 1910 in Provo, Utah [BYH Class of 1929]; Arthur Ben Candland, born January 7, 1915 in Provo, Utah [BYH Class of 1933]; Ruth Hanna Candland born October 13, 1917 [or 1916] [BYH Class of 1935]; and Barbara Hope Candland, born October 4 [or 14], 1918 [BYH Class of 1937]. ~ ~ ~ ~ Harold Arthur Candland was born March 16, 1903 in Mt. Pleasant, Utah. His parents were Arthur Charles Candland and Lydia Hasler. He married Eva Fontella Marriott on February 22, 1932 in Alexandria, Virginia. He died on May 7, 1962 in Takoma Park, Montgomery County, Maryland. Interment, Rockville, Maryland. Class of 1923. Maurine Carroll. Source: 1923 BYU Banyan yearbook, BYH section. ~ ~ ~ ~ Maurine Carroll was born March 31, 1904 in Orderville, Utah. Her parents were Charles William Carroll and Susan Amelia Synder. She married Carroll Hall Harrison on March 17, 1927 in Salt Lake City, Utah. She died on November 15, 1962 in Stockton, Califoria. Interment, Stockton, California. Class of 1923. Myrtle Childs. She received a BYH Normal Diploma in 1923. Source: Annual Record, B.Y. University, Book 10, page 344. Classes of 1921 and 1923. Class of 1921. Melba Clark. Source 1: Photograph of the BYH Graduating Class of 1921. ~ ~ ~ ~ Source 2: Class of 1921. Melba Clark. 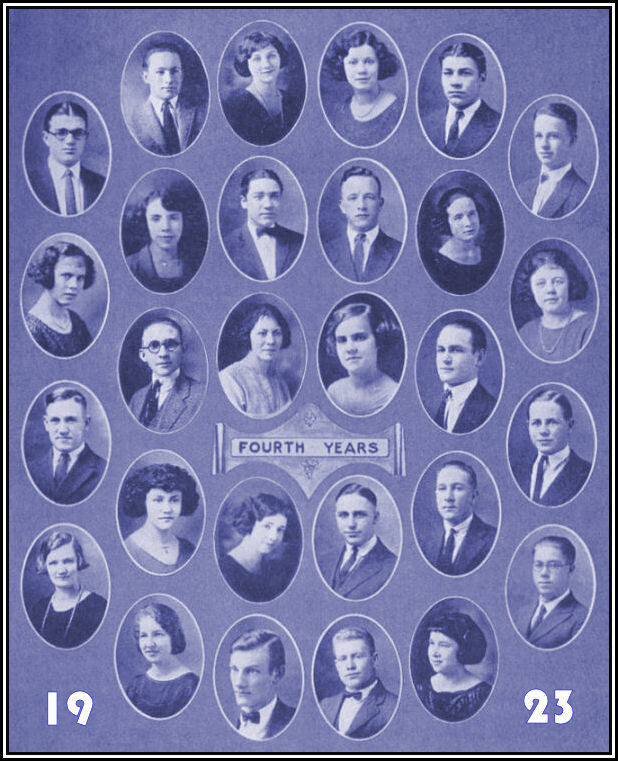 1921 BYU Banyan yearbook, BYH section. ~ ~ ~ ~ Class of 1921. Melba Clark. She received a High School Diploma in 1921. Source 3: Annual Record, B.Y. University, Book 10, page 144. ~ ~ ~ ~ Class of 1923. Melba Clark. She received a BYH Normal Diploma in 1923. Source: Annual Record, B.Y. University, Book 10, page 144. Class of 1923. Olive Crane. She received a BYH Normal Diploma in 1923. Source: Annual Record, B.Y. University, Book 10, page 430. Class of 1923. Clara Creer. She received a BYH Normal Diploma in 1923. Source: Annual Record, B.Y. University, Book 10, page Clara Creer. Class of 1923. Earl Crowther. Source: 1923 BYU Banyan yearbook, BYH section. ~ ~ ~ ~ Class of 1921 ~ Honorary. Earl Crowther. Member of the Class of 1921 as a freshman in 1918. ~ ~ ~ ~ Israel Earl Crowther was born on August 27, 1901 in Sanford, Conejos County, Colorado. His parents were James Franklin Crowther and Mary Olsen. He married Ruth Elizabeth Wintsch on June 22, 1927 in Manti, Utah. He died on May 28, 1952 at the age of 50, in Salt Lake City, Utah. Interment, Provo City Cemetery, Utah. Class of 1923. Blanche Davis. She received a BYH Normal Diploma in 1923. Source: Annual Record, B.Y. University, Book 10, page 148. ~ ~ ~ ~ Collegiate Grad of BYU, Class of 1925. Blanche Davis. She received a BS Degree [Ho. Admin. -- House Administration] in 1925. Source: Annual Record, B.Y. University, Book 10, page 148. Class of 1923. Carol Dunn. Source: 1923 BYU Banyan yearbook, BYH section. ~ ~ ~ ~ Carol Dunn was born December 24, 1904 in Provo, Utah. Her parents were Joshua Fielding Dunn and Fannie Eliza Elliott. She married Amos Bennion Chase on March 7, 1928 in Salt Lake City, Utah. She died on February 15, 1998. Class of 1923. Hazel Foote. Source: 1923 BYU Banyan yearbook, BYH section. ~ ~ ~ ~ Hazel Foote was born on April 27, 1905 in Glendale, Kane County, Utah. Her parents were Homer Clarence Foote and Olive Lucretia Rose. She married twice: First, to Lovell Albert Killpack, Sr., on June 6, 1925 in Salt Lake City, Utah, and Second, to Fenton Lyle Williams on February 6, 1972 in Salt Lake City, Utah. She died on February 12, 1986 in Salt Lake City, Utah. Interment, Provo, Utah. ~ ~ ~ ~ Her children include Lovell A. Killpack, Jr., [BYH Class of 1943] married Beverly J. Brown; Kenneth L. Killpack [BYH Class of 1949] married Doris Romboy; Weston Foote Killpack [BYH Class of 1954] married Lois Arlene Pope; and Myra Killpack [BYH Class of 1966~Honorary] married Thomas Prince.